Nafplio is undoubtedly the first destination choice for those who want to combine history and romance with contemporary and modern tourism. For sun lovers and swimmers, the beaches of Nafplio are ideal and they even offer the opportunity to sail and windsurf. For those who love hiking, a tour of Arvanitia, lasting about 20 minutes, is recommended. A paved trail below the cliffs of Akronsfplia and overlooking the bay of Argolis starts at the end of the waterfront and ends at the Plateia Arvanitia. After passing the “Banieres” "baths", which is the Marine Club area, you will reach the edge of the steep coast, walking along the rocks filled with prickly pear cactuses. For a romantic night walk, the stroll from the lighthouse to Arvanitia is ideal. Every night, the place is filled with families, groups of young people and couples in love. Nafplion, is an ideal city for cycling as it is mostly levelled. Therefore cyclists often arrange a cycling trip in and around the city of Nafplio, and invite all interested parties to follow them on their adventurous journey. It should be noted that the community has long recognized the need for promoting cycling, and has therefore placed a bicycle lending in the square outside the Town Hall. This is a great way to cycle through the city and explore what it has to offer. 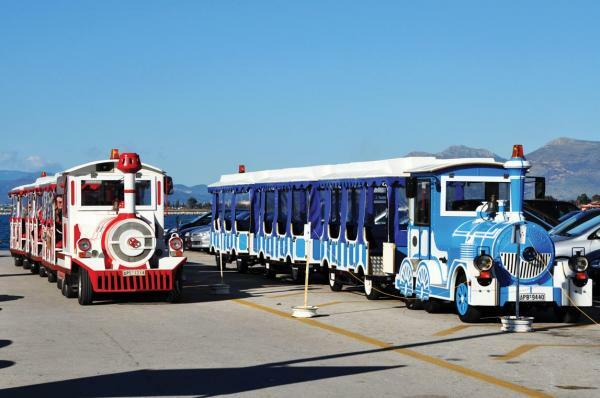 There is a small tourist train which is not only ideally for a guided tour of the city but also a pleasant way of entertainment for all ages. The train, which starts from the harbor, passes through many beautiful streets and the main attractions of the city. It is especially popular with children, but adults also enjoy it as, in only one hour time, they can visit the city in a special way and without fatigue. Children will love a ride in the Municipal Park and visit the train museum, where there are real tracks and preserved old cars. Also, the Peloponnesian Folklore Foundation has established a small museum dedicated primarily to the children in a building of the old railway station. The themes are related to birth, baptism, school, games and objects and figures from puppet shows, which will fascinate the little ones. There are also educational programs aimed at teaching through play and fun, with love and respect for tradition and the environment.